Panna cotta is incredibly easy to make, and if it takes you more than five minutes to put it together, you’re taking too long! The result is a silky, custard-like dessert that pairs well with fresh fruit, a compote of baked fruits, or even just a spoonful of homemade jam. Interestingly, it’s become popular in Paris and nowadays, it’s just as common to see it on menus as crème caramel and crème brûlée. The nice thing about Panna cotta is that you don’t have to make a custard or worry about baking it in a water bath. And the pairing possibilities are endless. 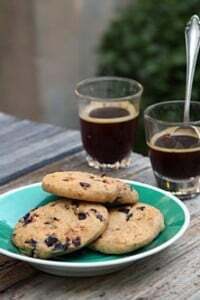 This recipe is adapted from my friend Judy Witts, who has been teaching cooking classes in Tuscany for decades, and leads culinary tours. I spent a few days with her in Italy and within the first few minutes, I knew I was in expert hands as we toured the market and tasted our way through Florence. Judy bypassed the traditional route and self-published her own cookbook, Secrets From My Tuscan Kitchen, a personalized, hand-written recipe book with favorites from her Tuscan cooking classes. It’s become a favorite in my house and I recently updated the recipe on my site with some new pictures when I saw how lovely ripe nectarines, raspberries and cherries surrounding the creamy white mound of silky cream. 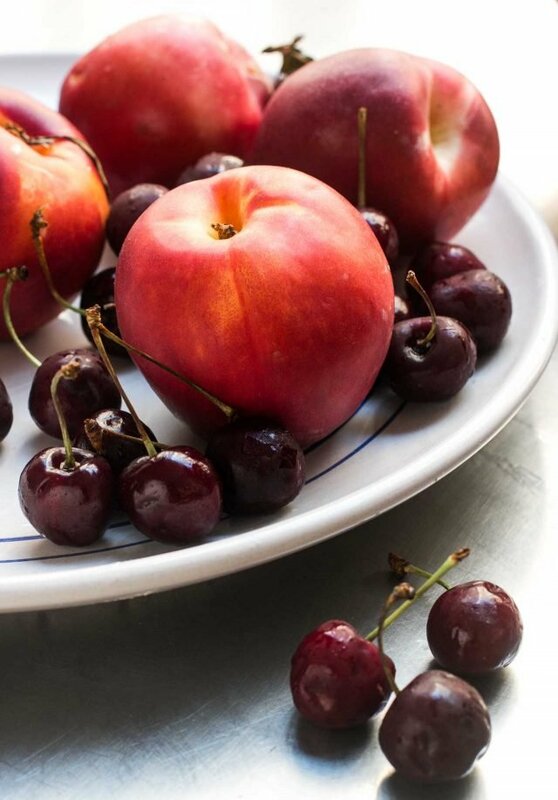 Other accompaniments could include salted caramel sauce, cherry compote, a drizzle of aged balsamic vinegar, cherries in red wine syrup, baked apricots or plums, or as I did here, with berries and nectarines marinated in the refrigerator for a few hours in sweetened red wine. For picnics or another presentation, you can also make Panna cotta in jars or glasses and serve it without unmolding. If you want to cut the richness of Panna cotta, you can swap out half-and-half for the heavy cream, or buttermilk. Because there are no eggs or custard-making involved, you pretty much have a lot of leeway when making Panna cotta. One could infuse the cream with lemon verbena, fresh mint leaves, cinnamon sticks, or even rose petals, in place of the vanilla. Don’t fret if you don’t have custard cups or molds. 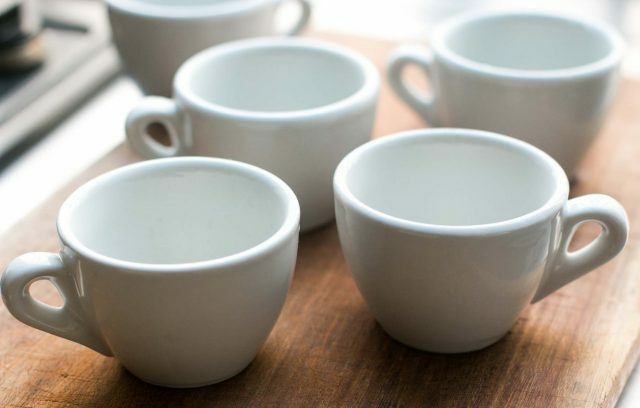 I made mine in coffee cups, oiling them lightly before pouring in the Panna cotta mixture. They turned out beautifully. 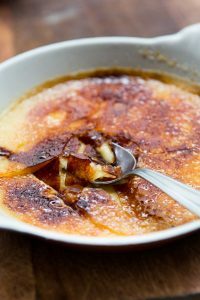 Adapted from Secrets of My Tuscan Kitchen by Judy WittsI love this dessert and the great thing about Panna cotta is that it needs to be made in advance, the perfect do-ahead dessert. You can make them up to two days ahead and keep them well-covered and chilled. For gelatin-related questions, read my Tips for Using Gelatin. You can find instructions for using sheet gelatin at the end of the recipe.I’ve not used non-dairy milks, such as soy, coconut, oatmeal or nut milks, but I am sure they would work with this recipe. For alternatives to using regular gelatin, check the links at the end of the recipe. To make buttermilk Panna cotta, substitute buttermilk for a little more than half of the heavy cream that's called for. Heat only the cream. Then, in step 4, let the mixture cool until tepid, and stir in the buttermilk. 1. Heat the heavy cream or half-and-half and sugar in a saucepan. Once the sugar is dissolved, remove from heat and stir in the vanilla extract. 2. Lightly oil eight custard cups (or similar vessels) with a neutral-tasting vegetable oil. 5. Divide the Panna cotta mixture into the prepared cups, then chill them until firm, which will take at least two hours - but they may take at least four hours. If you’re pressed for time, you can pour the Panna cotta mixture into wine goblets or drinking glasses so you can serve them in the glasses, without unmolding. 6. Run a sharp knife around the edge of each Panna cotta and unmold each onto a serving plate. If your molds have curved sides, run a small, thin-bladed flexible silicone spatula around the inside of the mold or cup to release the Panna cotta. Serve with some of the suggestions listed in the post. Panna cotta is my VSP’s and my favorite dessert. One of our regular haunts serves panna cotta with a thick layer of caramel on top. It is divine. I’ve been wanting to try my hand at panna cotta. I think this recipe will be the one. Thank you, David. This looks fantastic, I will definitely try to make it! Hi Mike: Oddly, it’s not that easy to find fresh liquid cream at my market or at the fromageries I frequent. Their thick, amazing-tasting crème fraîche is excellent, and I use that for certain things, when I can. (Although I try to be mindful of the global audience and try to use products that are widely available, whenever possible.) For those recipes, I buy crème liquide at Monoprix, which is fresh, not sterilized. Hi David. I live in Paris and have 2 questions regarding this recipe (which I cannot wait to try): 1. what type/brand of cream is right for this recipe; 2. can one find powdered gelatin in monoprix, casino, etc.? Thanks! i love panna cotta! when it’s made with super fresh cream it is sublime. david, do you know if it is possible to use agar agar or vegetarian “gelatin” to make it? when cooking for veg people i’m so sad that i can’t serve this desser. have you heard of anyone making it by substituting something for the gelatin? How warm should the cream mixture be when you add it to the gelatin? I have had several gelatin disasters and wonder if it’s because my liquid was the wrong temperature. Around 49ºC/120ºF is just right, keep it under 60ºC/140ºF to keep from degrading gelatin. You mean that a liquid to hot could ruin the gelatin and explain why sometimes my gelatin based things stays liquid ? If so, I will have to really thank you for finally having an explanation to my gelatin disasters as Accidental Parisian puts it ! Wow, what a great easy recipe! may I use crème fraîche instead of liquid cream, or is liquid cream the only choice for some reason ? This looks dreamy! Magnifique! How much agar-agar do you think I should substitute for this specific recipe, David? I’ve found that you need much less agar-agar than gelatin. I substitute 1.4g of agar-agar for every 5.3g of gelatin. I hope that helps! That’s helpful, Connie: now that I would try…don’t like gelatin, too often porcine. Tonight I made a chocolate blancmange…with milk and cornflour, sugar, cinnamon, cocoa powder. No gelatin, not porcine. The spoon tasted delish. Too full of pasta to eat it tonight. AP: I don’t know the exact temperature, as I’ve never measured it. It should not be boiling, but it should be slightly steamy. Warda & s. graham: The previous post about gelatin has a link at the bottom where you can find information about using agar agar. Krysalia: I haven’t made it with crème fraîche, but you might want to try using half crème fraîche and half crème liquide, and don’t heat the crème fraîche since it can change the consistency of it. I’m sure you could heat it and it would be fine, but I just haven’t tried it and that’s where I’d start. I love French crème fraîche…but it’s too dangerous to keep around the house! Arabella: When I lived in San Francisco, I used a lot of Strauss cream, which is one of the few that was non-UHT. Another brand I liked a lot was Clover. This is a legitimate question — I’m not trying to be smart-alecky or snarky. If you’re making panna cotta, which is made from cream, which comes from cows…why would using agar-agar or other non-animal gelatin make it okay for vegetarians? Please don’t be offended…I guess I’m not getting the subtlety that suggests that it’s okay to eat the milk but not the gelatin (which I understand comes from the hooves — sorry to gag anybody who didn’t know that). And I know that there are plenty of “divisions” of a vegetarian diet — ranging from vegan with no animal products at all (I totally get why those folks would use agar-agar…but what would you substitute for the cream? )…through pescetarian to lacto-ovo to just ovo and just lacto….but this one has sailed right past my head. The rules can be confusing. A vegetarian will not eat the animal but may eat milk and milk products as well as eggs from chickens. The cow doesn’t have to killed to collect milk; it does have to killed to get gelatin from hooves. The non-animal form of gelatin is also useful those who keep kosher and will not use a meat-based gelatin with a milk product. A vegan could try other forms of “milk” from nut milks to soy milk to coconut milk. I’m not sure how those would work. Looks delish, and is something even I can make in my rudimentary kitchen, thank you! Hi Sunny: Some vegetarians eat dairy products while others don’t. Folks have various reasons for being vegetarians but since butter and milk production doesn’t harm the animals (although there’s likely an argument out there that it does..), some vegetarians do consume dairy products like cream, milk, eggs, and butter. But since gelatin is made from animals parts (bones and skins), most vegetarians would find gelatin off-limits. I haven’t made panna cotta with soy, rice or coconut milk, but I’d be interested in hearing from any who have tried any of them. Also, animal gelatin is a problem for those who keep kosher and who do not mix meat and milk in the same recipe. I’ve listed some gelatin alternatives, such as fish-based gelatin as well as vegetarian substitutions, or people could swap out nut/soy or another kind of milk, for the cream. The good thing about Panna cotta is that it’s versatile! Each and every one of us may have personal reasons for not using gelatin. For my part, it is because it is not Halal and is, generally, made from pork which, being a Muslim, I am not allowed to consume. I love this blog! My daughter is currently on a panna cotta craze. She tries it at every restaurant that offers it and she really knows the nuances that make it right. We are going to make this together; she thinks that whole gelatin thing is positively magical, albeit a bit skeeved as to where it comes from. I’m vegetarian, lacto-ovo, (mostly for the reason that I have never been able to swallow meat, even as a child) and I will eat gelatin, but I have to say that it bothers me a little. Has anyone else noticed the distinct barnyard-y smell when you pour the hot water over the powder? I think that’s why jell-o has so many awful artificial flavours mixed in! I would love to find a recipe for panna cotta with agar-agar, but in the meantime I think I’ll plug my nose and try yours David. I’ve done panna cotta with gelatin before and once it’s set there is no trace of that smell. 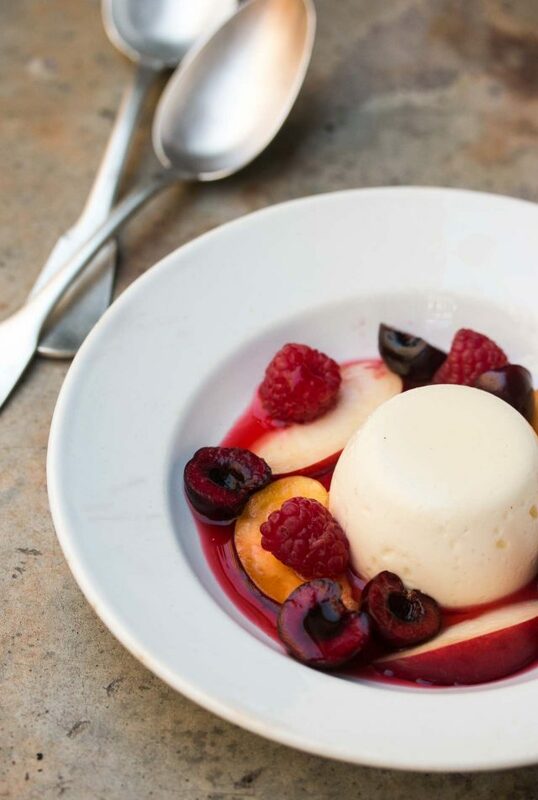 Panna cotta is what dreams are made of. I love a good panna cotta & yours looks wonderful. I think this is the first time I’ve seen the mould being oiled & it might just be the reason why my panna cottas are so fiddly. O BTW, have made your Frozen Strawberry Yogurt with hung curd thrice this season.Once with basil, once without, & my latest batch with pistachio nuts. That recipe is a winner & with hung curd, it’s almost like ice-cream!! Thank you for the perfect scoop!! Thanks for this recipe. I had the most perfect panna cotta in Carpentras France last summer at Chez Serge with fresh strawberries from the Carpentras Friday Market. I’ve been trying to get that same taste, that same consistency that his panna cotta had, but have been unsuccessful. The fact that I was in Provence probably played into that unforgettable taste more than anything. Warda, my apologies for not thinking about your situation — my head was trying to work through the animal product/animal product concepts, and Halal didn’t even enter my mind (neither did kosher, to be honest — is that an infraction of the meat/milk rule?) — that argument makes perfect sense…but still trying to get my head round the vegetarian issues. David> I think i’ll try exactly as you described, to have that little taste and texture added to the regular liquid cream panna cotta. hmm… i’m thinking about a sheep cream panna cotta in this very moment, I think that could be fantastic, but I do not have any idea where to find sheep cream :(. Ciao David and thank you for posting my recipe. think of jello shots, it is 1 package of knox to 1 cup of liquid for a more solid dessert and 1 package to 2 cups for a softer dessert. for me, it takes a couple of times to reach perfection! I hear buttermilk panna cotta is fabulous! Once perfected move on to infusing the cream- I do a saffron panna cotta which I call my Persian Version.. with candied rose petals as garnish and crushed pistacchio’s. Green Tea, Expresso, caffe latte served in cups with whipped cream and shaved chocolate. It is truly a dessert for all seasons! Thank you for the beautiful yet easy recipe. For sure I will try it in the near future! It really is one of the easiest desserts out there. After reading the gelatin post yesterday I made one with mascarpone and a little whole milk in which I dissolve the gelatin: If the mascarpone gets hot the finished product will have a layer of separated butterfat on the surface and the silky texture will be lost, so I warm the milk, dissolve the gelatin in it, let it cool a bit and then temper it into mascarpone that I’ve smoothed out with a little milk or cream. I have done crème frâiche panna cotta this way, too, and it works perfectly. You mentioned that you made the red fruits on top of the panna cotta with a whisper of kirsch. What is kirsch? Would it work if I just used from frozen red fruits and put some sugar on top? I can imagine a bit of caramel on top would work. David, I’d wondered about your gelatin entry and was waiting in suspense to find out why. Am encouraged to make it immediately by the promise it’ll be done in 5 minutes. Panna cotta is one of my favorite desserts to make. I usually make it with half cream and half buttermilk and vanilla beans. In July I sometimes I substitute a puree of blackberries for part of the liquid for (an old Gourmet recipe). If I want to get really festive I, make it in a terrine mould. The first layer is a jelly (made with gelatin, grape, passionfruit or mango juice or sparkling wine-whatever is handy). Before pouring the gelatin into the mould, I layer seasonal fruit- blueberries, strawberries or poached nectarines ). Every half hour or so I check to make sure that the fruit is setting in the gelatin and I push it down if it is floating . After the jellly has set I pour the slightly cooled panna cotta over it and let it set up overnight. Next day I unmould it onto a platter – it is such a lovely refreshing dessert- with a gorgeous profile once sliced – always a big hit. Maybe I’ll make one this weekend. So one quick question… I’ve made panna cotta before but my vanilla beans always sink right to the bottom while they’re setting. Do you have any tips or tricks to avoid that? I love Panna Cotta, and I’ve been doing them when in need of a easy to pull-off dessert. I’ve managed to put one on the dessert menu of the restaurant. It’s yogurt panna cotta with peaches, honey and almonds… One of our simpler desserts.. I did a heavenly one with goatmilk yogurt! Oooh, this does look simple. Yummy photos, too! Have you ever tried caramel panna cotta?? My favorite addiction is the caramel panna cotta at Miette in the SF Ferry Building. Perhaps now I will get ambitious and try to duplicate it. Thanks, David!!! Wow the panna cotta looks absolutely gorgeous! How do you unmold panna cotta without causing any damage? I love panna cotta. In december I made one flavored with orange peel and cardamom, served with a pomegranate puree, it was delicious. I also like the honey/basil and strawberry/lavender flower summer tastes. Never had trouble using agar agar instead of gelatine. mmmmm…go for it with the lemon verbena. One of the most memorable desserts I ever had was a lavender infused panna cotta, I imagine the verbena may be the same. Wonder if it could be used in a savory context, maybe with Mexican as an ‘enhanced’ sour cream (infused with chili peppers?)…? Or with blue cheese as a steak ‘sauce’ in a teeny ramekin. Lemongrass in eggdrop soup (like the sour cream dollop in borscht)? This is fantastic I have been racking my brain trying to figure out a do ahead dessert for a dinner party in June and I think this may very well be the one. And I think I am going to serve it in the wine glasses as suggested so I don’t have to stop and leave my guest for a long period of time. Hi Judy (aka Diva): Thanks for chiming in. Your saffron variation sounds lovely with pistachios. I love the idea of a Panna Cotta with orange flower water with pomegranate molasses (or seeds) and might try that someday soon. Marcia H: I’ve not used agar agar but glad to hear that it works well. Megan: Mine didn’t slip much at all. But you pre-chill it by pouring it into a metal bowl and stirring over a bowl of ice water, then pouring into chilled containers as it thickens. That will help it cool and thicken faster, and suspend the vanilla seeds. A perfect dessert for me is panna cotta. The best thing about this is any exotic flavor can be infused in it with no fuss, & u have an entirely new tasting panna cotta. I am looking to make panna cotta with no cream & just yogurt & plain milk if possible. Yet to try that out. I also found a vegetable jelly crystal, which uses vegetable gum, as i was looking for gelatin substitute.. ( the store ran out of agar agar)..
what a coincidence! i’ve made this dessert several times in two weeks. i never realized how easy and delicious it was to make. everyone i’ve made it for has raved about it. i served it with strawberries and sweetened reduced balsamic with a touch of pepper. strangely delish! Swap out the cream? Well, um, OK, I suppose. But lord, I’d rather have it just as you’ve made it. Cream, after all, is a beverage. Hi David. I recently made a panna cotta replacing half of the cream with 1/4 coconut milk and 1/4 coconut cream. I infused the cream mixture with kaffir lime leaves and let it steep for a while. I then reheated it before adding the sheet gelatin. It came out terrific! The only time I tried to make panna cotta it was from the book, The Sweet Life, and called for the use of egg whites to help thicken the custard and thus reduce the amount of gelatin needed. I have never seen egg whites used as a custard thickener anywhere else and wasn’t sure if I had the technique right in attempting the recipe. Any advice on using egg whites in panna cotta? Gorgeous picture David. The berries are making me drool and your panna cotta is so smooth and perfectly lovely. Have you ever done the wine goblet no unmolding version? That appeals to me. I have a running streak of unmolding boo boos to my credit. I follow instructions and recipes, so it must be my nerves making everything stick. Oh well. I was curious about your berries, what kinds are in that dish? One of my favorite things about the summer markets in Paris were the beautiful baskets of berries. The wild little strawberries and the mixed berry baskets lined in pink scalloped paper, I swoon! Side question if you get a chance. What are your feelings about semi fredo? I just don’t get it. I love making panna cotta for dessert – so handy that you can prepare it in advance! I also enjoy experimenting with different flavours – a while ago I added grated hazelnuts and lemon to my base, which worked out really nicely. Don’t know that this would absolutely work with panna cotta (but it should), but my grandmother used to unmold Jello desserts by dipping the bowl briefly in hot water. The heat melted just the thinnest layer of Jello along the edge, which allowed her desserts to slide out of the mold without incident. I just had one of the best panna cotta ever last Saturday while doing a little trip to the countryside…. Lemongrass infused panna cotta, topped with raspberry puree …. as I was nearing the bottom of the glass in which the panna cotta was served I wished to be able to perform magic so to never let the glass run empty…. it was soooooooo good! Sarah: Yes, doing it in glasses is even easier, and it looked great topped with berries or chocolate shavings. Hi Anji: You can check out the post: My Food Photography Gear to see my stuff! j9: Great idea. I love lime and coconut! Sophia: Thanks for the reminder that balsamic vinegar is insanely-good over Panna Cotta. I still have a bottle left from my trip to Modena, where I learned about making balsamic vinegar…which was an amazing experience. Can I just say how much i love your website/newsletter etc etc. ( I only recently discovered you) We now live in the Vavin/Jardin area and I am making full use of all your wonderful information (for example restaurant Le Timbre was a big success—ended up sitting wedged between the chef’s parents and 2 editors from Penguin sent there by the ambassador’s wife—it was like a party with everyone having to sit so close and the duck confit was yum). I could go on with other fun things as well. I see Patricia Wells at Raspail on occasion (in v. expensive looking jogging gear? ?–I swear it is her). Anyway, thanks for the excellent information on all subjects, not just food. We will be at your book signing at WH Smith in May. I agree, Panna Cotta is the most foolproof recipe. But when I use vanilla I always have a “visual” problem that not affects the taste. Almost all vanilla sinks down and and concentrates in a different “phase” at the bottom of the mould which turns up when unmolding. Is there a secret to evenly spread the little vanilla dots? I find that stirring the hot panna cotta over a pan of ice water to cool it before putting it in moulds and the fridge, seems to cure the separation problem. I wanted to share a panna cotta, I’ve done with coconut cream (milk), since David had asked to hear from those who’d tried that. 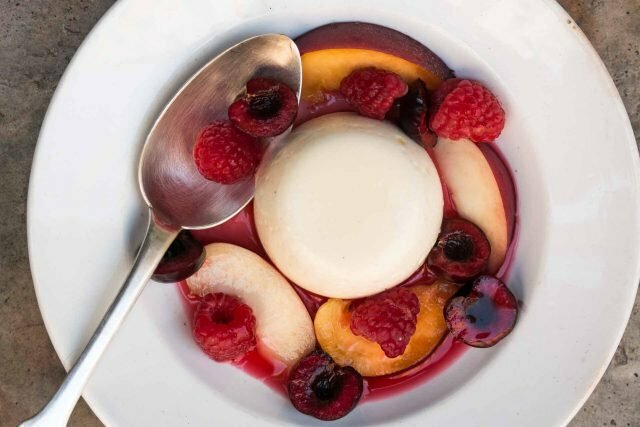 I can’t wait to try this panna cotta recipe. Lovely post! @Pradeep: Great blog! And particularly interesting for me who loves food from India/Pakistan/Sri Lanka/Bangladesh. I’ve been working my way through Madhur Jaffrey’s books, and I’ve also tried some of Anjum Anand’s recipes, as well as numeous recipes from the web. The food from this part of the world is the best there is, in my opinion. And it is particularly suited for the cold climates of Northern Europe, which is where I am from. Nothing beats a warm, fragrant curry on a freezing cold winter’s day. I love panna cotta!! I haven’t had this in years, my grandmother always used to make it and we lost her recipe a long time ago. I will have to try this and see how it compares. Thank you for the panna cotta recipe! Panna cotta is one of my all time favorites! I can’t wait to try this recipe and maybe some of the versions mentioned above. I love not only your blog, but also your readers comments….I always learn something new. I am indebted to you for life! I love panna cotta and am surprised at this simple recipe!! Trying it this afternoon. David: Have you (or can you) substitute youghurt for any of the milk? I made this last night (YUMMMMM) but thought if I made it very tiny and with something a little sour it would be a great addition to breakfast. Didn’t know if it would mess with the chemistry. Thanks! Charissa: I’ve not used yogurt, but I’ve made panna cotta with 1/2 buttermilk for half of the cream. I would not heat the buttermilk but instead, add the lukewarm cream mixture (after adding the gelatin to it), so it doesn’t curdle. There’s a recipe in my book, Ripe for Dessert (page 210), if you have it, with detailed instructions for a Buttermilk Panna Cotta. I have been seeking a simple and nice panna cotta recipe.Thanks for sharing! And particular happy to see your tips of using gelatin. Thanks David! I DO have your book (love it) and I’m picking up the buttermilk (which I would not have thought of) today. Thanks. I’ve never had panna cotta before, so I made this recipe and ended up with dairy flavored jello. Really, the kids could have got out the cookie cutters and made jigglers. I thought it was supposed to be creamy and delicious – I don’t get it. I used half & half because I had it on hand, but otherwise I can’t see where I might have screwed anything up. Ideas? Gabe: Judy’s proportions mentioned in her comments above are pretty spot on: 1 envelope of powdered for 2 cups of liquid, which is what I did. If you’re jelly is too firm, you can warm them to melt them down, add some milk or cream, and re-set them. A bit more sugar might to be in order to compensate for the extra liquid, to taste. I use 1 1/2 teaspoons of gelatin to 4 cups of cream, or a mix of cream and buttermilk, yogurt, creme fraiche, or sour cream. It sets perfectly, is incredibly silky, and does not become rubbery. Absolutely gorgeous! I have never made panna cotta. You are inspiring me. Thanks, David! I’ve wanted to make this for a long time. Might be nice with a strawberry-rhubarb compote for spring? Well I just made this and am eagerly staring at the clock to give it a taste. I am so pleased as I am have a large family coming for a month (2o people for 27 days!!) My SIL is allergic to butter(!!!!) and white flour so desserts have been rather tricky but this is perfect I am doing the test run today. I out some in lovely glasses, some oiled cups and some unoiled to see what final product is the prettiest. I thought i would put fresh strawberries on the bottom and as a garnish? I was wondering about other flavors, can I add a splash of extract to make it have different flavors or will it change the way it sets? How much would you use of a pure extract like coconut? David, Great site, thanks for sharing so many tips. Quick question, I am thinking about making this for a large brunch. What are your thoughts on making the Panna Cotta in shot glasses, as individual portions? How far in advance can I make it? Food Princess: You can easily make these a day or two before serving. David, I made this for my Easter dinner this weekend, and it was a big hit. Everyone, even the kids, loved it. I served with fesh strawberris, blueberrys and blackberrys, lightly sugared. 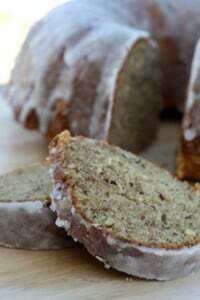 I have been reading your blog for awhile now, but this is the first recipe I have tried. It will definitely join my permanent collection. Amazing. I just made this for dessert, and it came out really well. I have always loved panna cotta but thought that it was probably tough to make. I can’t wait to experiment with other flavors! Wow, that does sound easy… now I will have to try it! Thanks for the recipe. When it’s berry season around here I’m always looking for vehicles to pile those juicy orbs on. Hello..panna cotta! Not that I was growing tired of Creme Anglaise, Coeur a la Crème, or homemade ice cream, but it’s always nice to expand one’s repertoire, especially when it’s cream-based. I have made panna cotta according to a similar recipe and it was quite good. However, it crossed my mind that panna cotta could be made with almost anything with fat in it. I have been eyeballing coconut milk and cream mixed. Or other milk-like products coupled with cream. The benefit to this would be that I can use leftover heavy cream with other pantry ingredients. I have not tried this. Am I missing something that will make this a disaster? It was perfect and so easy to make. I did modify it slightly because I am on a lavender kick, so I added lavender with the vanilla bean and then strained it out before I added the milk mixture to the gelatin. Thanks David! I’m not a fan of white chocolate, but I read your Valrhona post and saw the caramelized white chocolate, and I’m thisclose to being sold. Now I feel as if I need to give white chocolate another chance — maybe starting with this panna cotta. Thanks for sharing! Could a person use evaporated milk instead of the heavy cream when making Panna Cotta? Les: I haven’t used evaporated milk, but I would imagine it would work just fine. If you do try it, let me know how it works out. I have recently learned to make a great panna cotta and I must say that this recipe seems to use more gelatin powder than is reasonable for a set. The finest panna cottas I have had in New York are barely set, never giggly or Jello-y. Also, some gelatin powders have more in a packet than others. I used to have trouble with it setting in that the cream would settle into layers, with actual butter at the top. I resolved this by allowing the cooked cream to cool completely, stirring occasionally, before pouring into ramekins and refrigerating. But my best improvement came with the substitution of almond extract for the vanilla. It is so fragrant and fine. Hope you don’t mind my sharing; I love learning from your blog and have found many a “keeper” here. See? Destiny. I thought I’d check some panna cotta recipes online, and once again your website popped up. I love panna cotta because, as you say, they’re so easy, but they taste so elegant. I make a good lemon one except the last couple of times they’ve pretty much lost their shape when unmolded, so I thought I’d research to see if maybe the cream/gelatin ratio needs to be tampered with. Your recipe looks pretty much like mine, but I’m guessing maybe because I add some lemon juice, so it couldn’t hurt to bump up the gelatin a bit. I’ll give it a try; I think I’m going to try a lavender infusion next time. For a lemon panna cotta, to your recipe I’d add 5-6 tablespoons of lemon juice, depending on how tart you like it, grated rind from 3-4 lemons (again, to taste), and a little more gelatin, straining out the rind when you pour the mixture into the molds. I actually found red currants at the market, so bought some and took half and pureed and strained them and made a reduced syrup, added the remaining whole berries, and poured it over the lemon panna cotta. Fantastic flavor rush with the lemon! As for crème fraiche, I think it would work quite well; it certainly makes a great ice cream. And Trader Joe’s now carries it at a price cheaper than it would be to make your own. Made it, love it, idiot proof, another big thanks. I gave these a whirl over the weekend, substituting the vanilla for slices of ginger and a few teaspoons of ginger juice. Really delicious and I can’t believe how simple it is to make. Thank you for sharing this recipe, such a great canvas for so many different flavors – I’m thinking of lemongrass next, or even lavender. I used leaf gelatin and it says to use 25g, but the kind I had you needed more than 6 sheets to get to that amount, and the panna cotta was way too firm after setting. Is 25g the correct amount for leaf gelatin? Sheet gelatin can vary in size; the ones available in the supermarkets here in France do quite a bit. So I unable to advise about how many sheets it would take exactly to make this. I adapted this recipe from Judy’s, which was in gelatin granules. I made this tonight on a whim to go with homemade ravioli (decided to go Italian from start to finish!) and it turned out perfectly and was incredibly easy! So simple and so good I will surely make it again. Thanks so much for sharing! I made the panna cotta using heavy cream and it was delicious but did not compare with the Panna cotta at Lidia’s in Pittsburgh…at the restaurant it is light and silky in texture…would half and half instead of heavy cream correct this? I’m excited to try this recipe…esp. since I was just in Florence two months ago and saw Judy’s book – but didn’t actually buy it! Have a question re: the oil. What’s the best ‘neutral-tasting’ oil to use, in your opinion? Thanks! Sunny, gelatin is derived from the bones and hooves of animals, so, the animals have to be killed in order to have gelatin. However, an animal does not have to be killed to get milk from it. Many vegetarians eat milk, eggs, cheese, yogurt…but not meat. Vegans on the other hand would not eat anything animal based, no milk, no gelatin, etc. Hope that clears it up a bit for you. There are ways to make a vegetarian or vegan version of this, for those avoiding animal products. Some folks use agar-agar or fish-based gelatin, but I don’t have experience with either of them. Rebecca: I use canola oil, but any unflavored oil will work. I’ve used almond oil, which is nice, if you have access to it. Most natural foods stores carry it. I want to make Panna Cotta for a garden club of possibly 150 women. Will we be able to make it in large pans, and use a ladle or something similar to put it on plates. It won’t look as good as your picture, but if we use berries, is it doable? Sure. You might want to add a bit more gelatin if making it in a large pan (to compensate for the weight and so it holds it’s shape better when smooth). I can’t say how much exactly, but it should work out well! I have a question about the ingredients… Can I use fresh cream instead of heavy cream?? I read somewhere that heavy cream has a fat content of about 36% – 40% and the stores near my place sell only fresh cream(with a fat content of 27%). Would this be OK? I really want to try this recipe out and am afraid the cream might burn or something if I don’t use the right one. Please help! For those pescetarians out there, there is a kosher fish gelatin. Kosher gelatin can be made with fish bones, and/or beef skins. Contrary to assumptions, it is also considered kosher to use it with dairy products. Kosher law is very complex and the bones and hides used in gelatin production are considered pareve. The general meaning of pareve refers to foods that are neither milk nor meat, and many people assume this means that the product is vegetarian. However, OU pareve certified ingredients can have animal products, such as fish, eggs, and gelatin, in them. I have been a strict vegetarian for over 25 years. I have just had a lovely meal at a beautiful restaurant and asked for the pannacotta dessert but inquired what pannacotta was exactly and whether it was some sort of meat-based jelly as I didn’t understand. I didn’t ask outright if it contained gelatin (I usually do ask that for any dish which I suspect may contain gelatin). The waitress returned saying it was OK for me to eat BUT I think she misunderstood exactly what I meant. I think for the first time in 20 years I have eaten a gelatin dish now! I would love to trial a pannacotta recipe that was veggie. Vegetarians will not eat anything from the slaughtered animal, fish or bird or well anything that has been killed. We do eat dairy food but there is the argument that the bull calf has to be killed for the cow to continue being a machine to produce milk for humans so I TRY cutting down on milk as much as possible and having soya instead. Cows’ milk is not healthy for us – read “The China Study”. Hi, I heard people who have made panna cotta, that it splits into two distinct layers. Why does this happen and how to make sure it doesn’t happen, before I try to make it? Thank you in advance. @LC. Hey, yeah I had that problem the first two times i made panna cotta but most recently I tried prechilling the mixture in an icebath to about 50 degrees F and it worked out great. I just made this. It was ridiculously easy…and turned out perfectly! It was also the first time I used gelatin sheets…they worked beautifully. I used 10% organic dairy cream, and no problems. I can’t wait to try out some variations. thanks! Bradford: That’s a great idea and glad it worked. I love passion fruit, although folks should make sure not to use it to flavor the panna cotta (since it contains an enzyme that will prevent gelatin from setting), and to put it over the top, like you did. I actually like the seeds of the lilikoi! Thanks for sharing your success story and variation..
@Kristen, there is a traditional Hawaiian desert named Haupia that is a coconut milk panna cotta of sorts only it uses corn starch insted of gelatin. Thank you for the recipe! I used agar-agar instead of gelatin and came out as well. I wanted to pass on a little trick I found in my morning paper one day. If traveling with the panna cotta, try putting them in to small jam jars. I use the short wide ones (more room for toppings:) I set up a few small bowls with different fruits, chocolate and nuts. Great for BBQ’s and potlucks! I love Judy’s Divina Cucina site! I have been using it as a resource for recipes since I moved back from Florence myself. I didn’t even realize that she also had a blog or a cookbook out. Thank you so much for featuring her! For anyone near Auckland, NZ this can be had at the Leigh Sawmill Cafe which is about 1.5 hours north of Auckland. This was my second time preparing it and serving it. It turned out delicious and I could serve it every day if it wasn’t so high calorie, but I could settle for once a week. Thanks for the Perfect Recipe! I was inspired by a local spice shop owner to try flavoring with fennel pollen. Am still needing to play with the amount for right flavor, and to keep the vanilla from arguing with the fennel pollen! Pretty close to figuring that one out. The other flavor option I went with was lavender, in the form of a lavender sugar. Nice, but needed to add a bit more plain sugar, as well. In the future, will strain out the fennel pollen, but no need to strain lavender bits in this case, as already ground quite a bit. Sooo, it’s back to the beginning for me. These were my first attempts at panna cotta, and I was disappointed at how it turned out! But, the plum compote I spooned on top, using fresh plums from my tree out back, was divine. I tried it and it turned out lovely! Tasted awesome! very smooth and silky! However while cooling a layer of oil/fat formed at the top. Is this common? 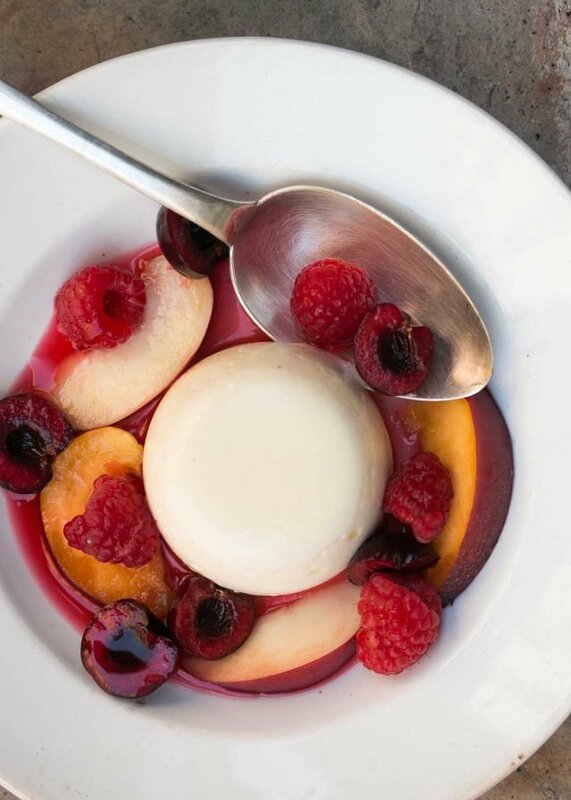 How do I get a a pure white panna cotta as shown in the picture? I just have tasted my first panna cotta a few times ago, and I hardly can forget about it! It was amazing, and I’ve been craving to taste another one! And so I ended up searching up on Google and I found this recipe and this seems easy and perfect! Love this recipe. I add some Frangelico (ads a hint of hazelnut flavour). This recipe was fabulous and super quick to whip up. We’re making quick work of eating the panna cotta too. Thank you!!! Thank you for posting this recipe! I think I have found my basic panna cotta recipe to start experiments with! It was simple to make and set beautifully. I had not tried reducing red wine with sugar before and the heady aroma was such a delight, and cooking pure cream that came out of a box that said “creme excellence” gosh… all together this was one of those dishes that pleases your senses so much as you work through it, and the end result was great too… thanks!! Oooh I forgot to add a tip to encourage anyone nervous like me with gelatin or grainy textures… add a step in to strain your liquids before pouring into your moulds. Its your insurance to a smooth silky texture! Family pressure means our Thanksgiving and Christmas dinner desserts must include my Grand Marnier panna cotta, with blood orange supremes and pomegranate seeds. Festive, beautiful and really delicious. There is a version from The New York Times that uses coconut milk (NOT low or non fat) for a slightly Asian flavor. This is a wonderful recipe; I’m glad to have some additional ideas for fruit accompaniments. Hey David, lovely post and photos. Have you tried it with half cream half yogurt? (I use the unsweetened Bulgarian style) I feel like it has a cleaner finish in the mouth—or should that be mouth-feel? Your posts are divine! One of the many blessings that came across the Internet! Thank you so much for sharing your knowledge and rich experiences. I do have a question on how you did the fruits(cherries and nectarine) in the sweet red wine. Thanks so much! thanks for this panna cotta recipe. as always, I want to make it now! Just wanted to tell readers who want to make large numbers, I live in the Bay Area, and you can get small disposable molds in restaurant supply places. I worked for a caterer for many years and we made them for events. They were always a big hit. This recipe is identical to our family recipe. We make this every holiday in my family. We use heavy cream and sometimes proseco which is divine. Always a fruit topping. Great pics and recipe! Love your site! Thanks David for this genius, simple recipe. I can’t wait to give this a go vegetarian style using Agar Agar. Your photography for this recipe is so beautiful and so inspiring! Just wonderful. This is a beautiful dessert; I love half and half in place of cream. The fruit adds a beautiful look as I’m sure a super tasty contrast. Yum! I learned to make panna cotta just a few months ago from this original blog post and it’s one of my favorite desserts! I love steeping the half-and-half in different types of herbal tea; it gives the panna cotta a lovely, delicate flavor. One question though: what is the ideal level of firmness? My husband likes his panna cotta barely firm enough to hold together – I’ve never had it in a restaurant so only have the super wobbly ones I make for us as a point of reference. And would adding purée or other ingredients require changes to the amount of gelatin used? Thanks all! My favorite panna cotta recipe is from Ruth Reichl’s My Kitchen Year. It consists of heavy cream, lemon juice and zest, and sugar — that’s it. Every time I serve it people rave and want the recipe. It’s so easy but is a fabulous dessert — so creamy and smooth. Every time I try to make panna cotta with gelatin it’s comes out rubbery. Thank you so much for making it possible for me to copy this recipe. I danced for joy when I saw the Print Recipe icon . Leaving in the UK, our gelatine pages weigh less. Following your guidelines, 2 packets are about 12 grams which is indeed about 6 UK Costa pages. It is not however 25 grams. Confusing but thought it might be helpful. Living in the UK, our gelatine pages weigh less. Following your guidelines, 2 packets are about 12 grams which is indeed about 6 UK Costa pages. It is not however 25 grams. Confusing but thought it might be helpful. Ive always wanted to make panna cotta. Funny, it always seems to be their downfall on “Top Chef” when a contestant decides to make it. Is that a huge spoon or a teeny pannacotta? I want to make a lavender one. Hi David – Thanks for inspiring me to make pannacotta for the first time in over forty years of cooking BUT…! – I think your quantities of leaf gelatine may be out, at least by weight. I’ve just made a half quantity of the recipe and used 12.5g, which at the time did seem rather a lot. When it was set I could have bounced the results on the floor! I suspect about half that quantity would have been correct….. Thanks for your feedback on the sheet gelatin amount. It’s very hard to do a straight substitution for powdered to sheet gelatin because there is so much variation in the sheets. I’ll make it again with leaf gelatin and update the results.